Having a newborn can be challenging. Having a newborn in addition to having a very active toddler is exhausting! I thought we had it covered when it came to baby proofing but these last few weeks have proven us otherwise. It seems like every time I’m attending to my newborn my toddler disappears and gets into something new. I honestly struggle sometimes to keep up. That was until I discovered a new baby monitor on Amazon. 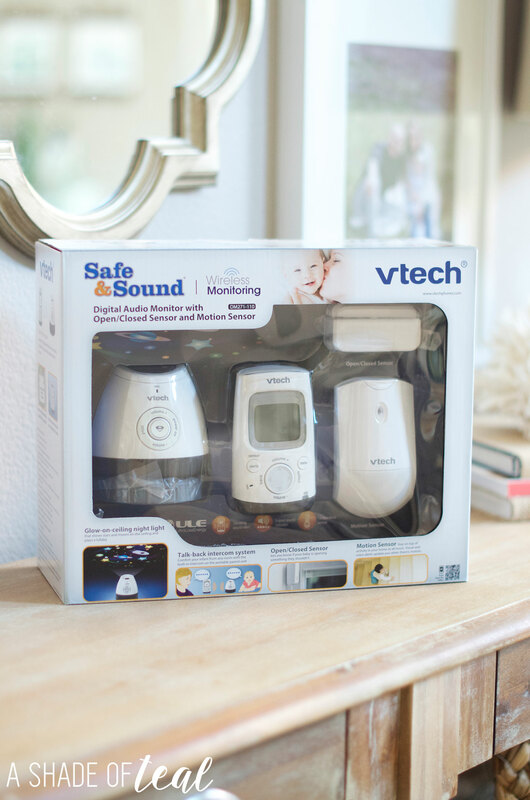 The VTech Safe&Sound DM271-110 Audio Monitor with Open/Closed and Motion Sensors has been a life saver. 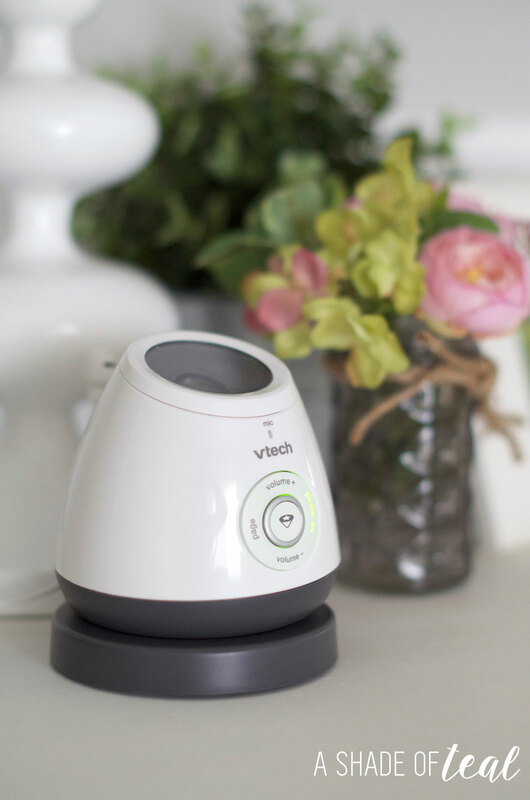 The VTech Digital Audio Baby Monitor is not your typical baby monitor. For starters it does act like a regular baby monitor but it also includes a Open/Closed monitor and a motion monitor. The main part of the VTech Digital Audio Baby Monitor gets placed near your baby and is equipped with a two-way talk-back intercom. I absolutely love this feature since I can be downstairs and if my husband is upstairs with the baby we can easily talk over the intercom. 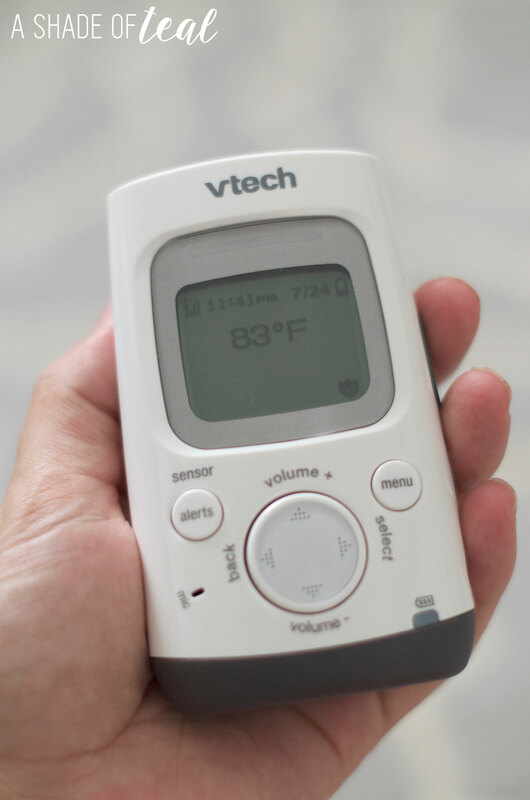 The hand held part of the VTech Digital Audio Baby Monitor will become attached to your hip. It literally has a built-in belt clip but it gives you up to 1,000 feet to wander. The hand held is how you get alerted. You can even adjust the sound off and have it vibrate when one of the other devises are triggered. It also displays the temperature, which as you can see it was pretty hot in my home that day! If it gets too hot it will alert you that the temperature is too hot. I think one of my favorite features is the glow in the dark night light. 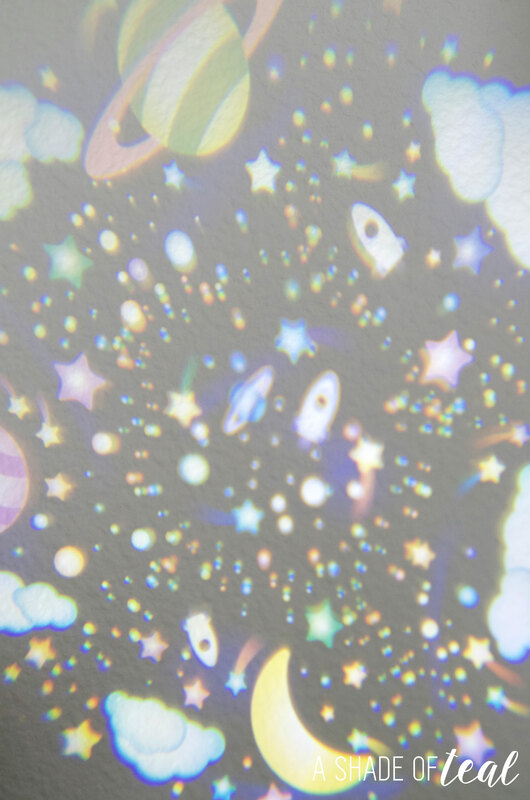 It displays the moon and stars onto the ceiling. The base also allows you to adjust the direction you want the night light aimed. Plus, it play’s a lullaby which my daughter loves! 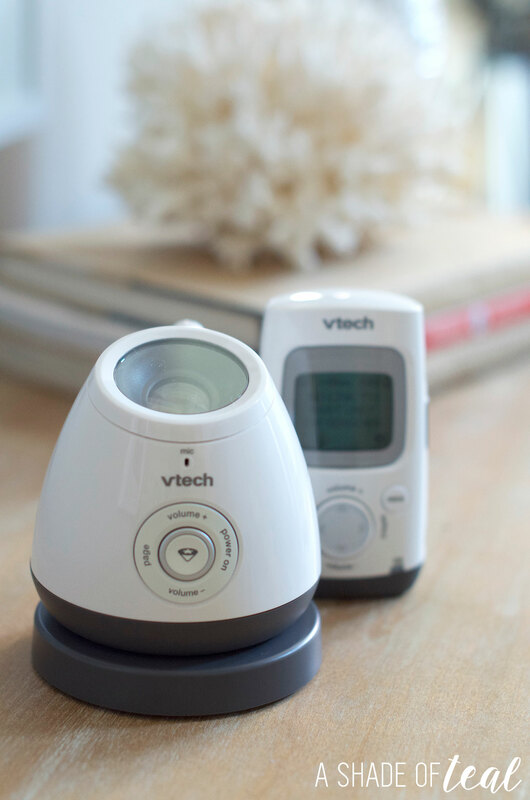 The Motion part of the VTech Digital Audio Baby Monitor is a great feature. You can place it anywhere with easy mounting tape and it will notify you if someone triggers it. I placed mine at my front door since my toddler has been know to escape. The first time she discovered how to unlock the front door she ran out, I mean ran! This scared me so much since she still doesn’t understand the street is off limits because cars pass by. The next day we purchased an additional baby lock for the top of the door. This is a great lock but the only problem with it is if you forget to lock it or in my case when my husband leaves for work I need to always remember to lock it. This is where the VTech Digital Audio Baby Monitor comes in. By placing the motion sensor at our front door I get a alert anytime someone approaches it. My daughter has yet to escape again! Finally the VTech Digital Audio Baby Monitor comes with a open/close monitor. I decided to place this on our slider that goes out to the backyard. This is another door my daughter likes to open and help herself out. If I happen to be upstairs and my toddler decides to go downstairs and opens the slider I get alerted immediately. The nice part about the open/close feature is that it won’t continue to go off if the door is open. Since this is our slider into the backyard we do like to leave it open from time to time, the monitor will alert me only once when the door is open. The system only comes with 1 open/close sensor but you can easily purchase more to place them on every door or window. 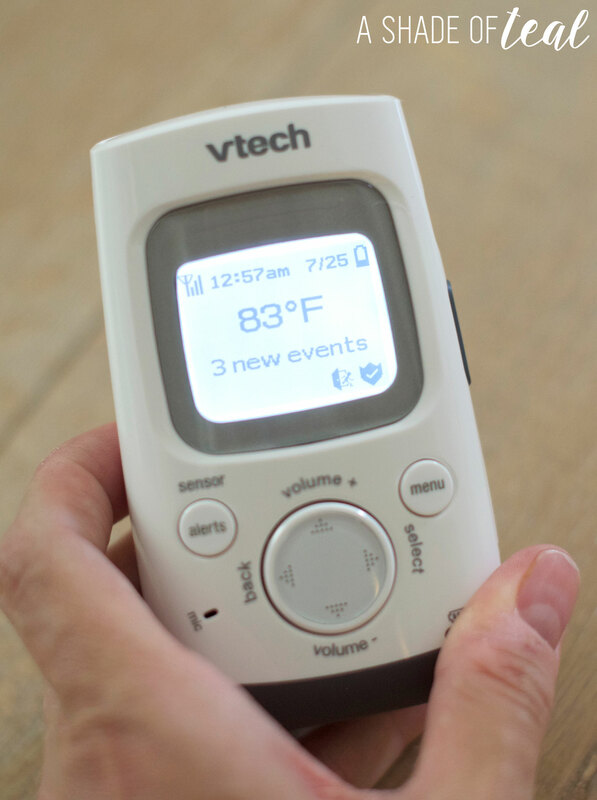 The hand held monitor of the VTech Digital Audio Baby Monitor will also keep all the events/alerts saved in case you do step away from the monitor. As you can see I have 3 events which means something was triggered 3 times. Like I said before; having a newborn and a toddler is hard, but things have gotten a little easier now that I have the VTech Digital Audio Baby Monitor to help out. You can purchase the VTech Digital Audio Baby Monitor at vtechphones.com or amazon.com. Have you tried any of the latest monitors from VTech? Which monitor do you have? I love finding new gadgets that help with parenting and make my life easier. For more ideas on staying connected at home follow VTech’s Pinterest page or their Facebook page. Mommy & Toddler Travel Car Kit's, & What to Pack! Give the Gift of Finding, the Perfect Stocking Stuffer! I love that glow in the dark feature too, it makes it easier to locate at night. And, coming from the trusted brand in technology accessories it’s a thumbs up! I amazed at all of the baby gadgets today! I don’t know how we stayed alive without them! If I had kids I would probably get this! This kind of technology did not exist when I was raising my daughter. We were lucky to have the audio baby monitor, where you could hear them when they woke up. My, how things have changed. Wow! That’s a lot of features in one package, it’s definitely not like your typical monitor and I love the idea of being able to do things around the house without worrying so much about your baby. This is awesome! Kudos to vtech for making such an awesome product! I had a child that learned how to open the door at an early age. We too had a lock like this on our door. Great! This baby monitor is so necessary for first time parents. Love the light show effect! We co-sleep with ours so don’t need this kind of thing, but I’m sure it would suit some parents. That is really versatile in how it can be used to help you. What a cool set-up! What a nice looking baby monitor that is! Mine was this huge box thing with a radio-type thing…but of course that was 10 years ago, haha. Nice idea! For sure mommies will love this. I will recommend this to my friends. I am simply amazed by all of the things that monitors can do now! It is incredible! Oh, great product. I remember the anxieties I felt when my son was so young, this is a very helpful product. So many great features. 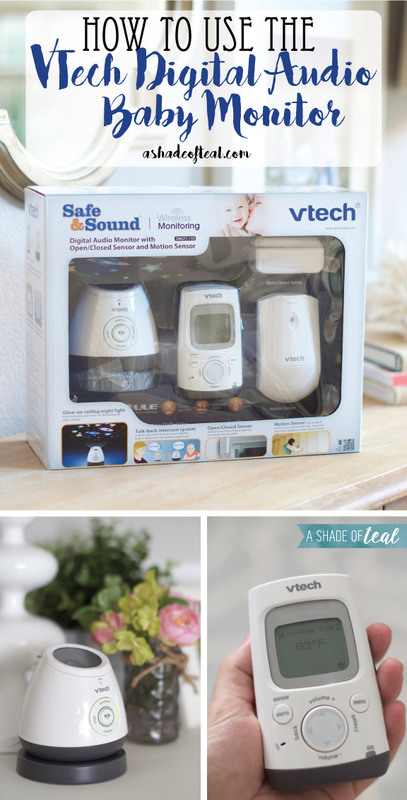 The baby monitor is one of my most favorite baby shower gift ideas. No new parent should be w/o it. Um, wow wow wow! This is definitely the next monitor I will be getting! Love all the features! This is my first time to learn about open/closed sensor features. Currently, we have a digital monitor by Avent, so far its working good but I would love to try Vtech next time. Thanks for sharing!